Those who love all things bright and colourful will enjoy a quick scroll through the Indian Ocean WAMs for the coming fortnight. One by one, blobs of purple and red are pulsing towards Western Australia and Indonesia in one of the most active storm periods seen in the last few years. We've already got a large long-period south-west groundswell on the way for this Sunday, with the Rip Curl Padang Cup most likely being run, but the storm that generated this swell is nothing in comparison to what's forecast to develop over the coming two weeks. Two successive amplifications of the Long Wave Trough (LWT) will move slowly across the southern Indian Ocean, the second being the real money maker, it's the stronger of the two and projecting well into the mid-latitudes. Surface fronts and storms follow a similar path to the Long Wave Trough, and when it's amplified over a certain region we see these surface features strengthen and focus into the said region. The storms actually take a path just west of where the LWT is amplified or subdued, as the surface weather lags the upper atmosphere which moves slowly eastward around the south pole. An initial strong node is currently strengthening in the south-east Indian Ocean, resulting in a flurry of strengthening polar storms piggybacking each other south-west of Western Australia over the coming days. This will produce a large and active open ocean sea state for one final and very significant fetch of storm-force winds to move over, projected up and into the Great Australian Bight. 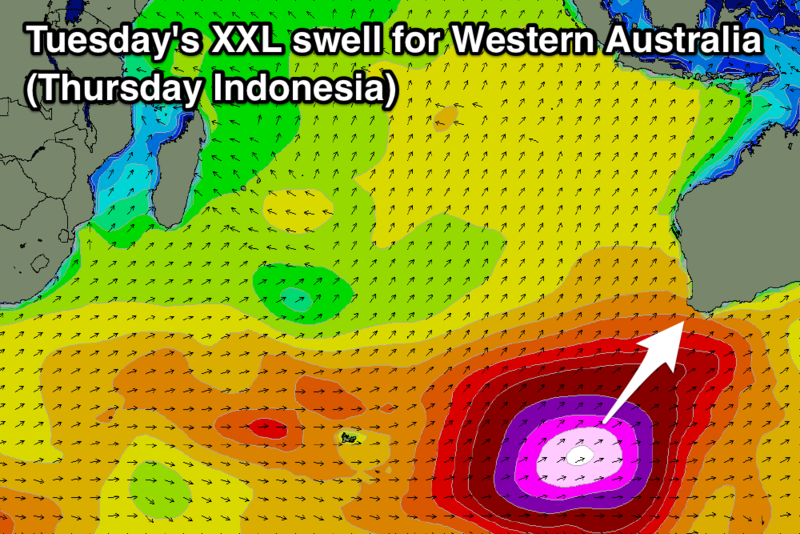 An XXL long-period groundswell will result for the southern Australian coastline this coming Tuesday, with Indonesia seeing an XL south-southwest groundswell on Thursday. Usually such swells are met with strong onshore winds across Western Australia, but in this case a strong high will quickly move in through Tuesday resulting in mostly light and variable winds across the state creating favourable conditions for those willing to tackle the monstrous conditions. Margaret River looks to peak around 18-20ft, with larger waves at deepwater offshore reefs, and larger surf again on the more exposed southern coast. It's worth noting the Indonesian models are combining a couple of swells on Thursday and over-forecasting the size. Though in saying this, we're still due to see 12ft+ surf across exposed magnets under E/SE trades. 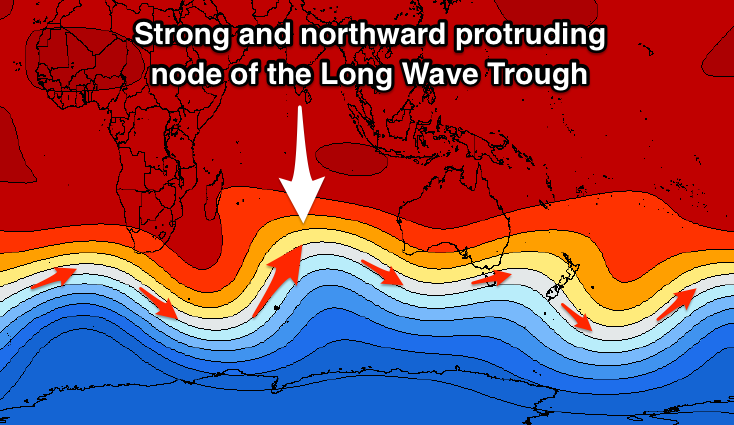 Now, the second stronger node of the Long Wave Trough will make its presence felt further north into the Indian Ocean and peak further west, resulting in the Southern Ocean storm track to protrude much further north than usual and with strength. This will send back to back polar fronts close to Indonesia producing back to back XL groundswells in a run of swell not seen for at least a few years. It's a little too early to dial down the specifics but we're looking at XL groundswell energy out of a south-west direction from early in the week starting the 23rd of July. Confidence on such significant swells is high as the models have been consistent with the strong amplification of the LWT across the Indian Ocean. Keep an eye on the Indonesian, Western – Southern Australian and Victorian forecaster notes over the coming fortnight for a clearer idea on the timing, size and local winds with each significant swell pulse. Craig, what likelihood of these, especially the second pulse, generating something solid into the Maldives region? First swells no, but the second pulses for sure. The Southern Atolls will be large, and likely some swell also refracting back into the exposed magnets around the Male region. Thanks Craig, that's along the lines of what I thought. Unfortunately not going to be in the south but hopefully it'll make it's way through to the Male Atolls. Craig when you say second swell what dates are you referring too? North Male atolls struggle to get any groundswells west of south. Yeah it's shifted around a bit now and the secondary swells don't look to get into north of the Southern Atolls. Need essentials get Laurie Towner to Kandui for this swell !! Was thinking the same except I vote red bluff or the RIGHT! Where do you surf when its 10m @ 20 seconds and light sw in SA? Hangin to see what decoudic data says on tuesday. What if its just plain ol sw? First year with a proper full time, need to ask for leave off, job. Had the choice of taking the next four weeks off or wait until later in the year. I am really regretting my choice now. Stu - if I pay for a subscription, does that guarantee an equally good run of swell in September? But hey, this next run of swell is a gimme; a lay down misere for every surfer in Indonesia. It's when the swells are unpredictable that you really want the model info, right? Welcome to the real world! Ain't it sweet? Stu - Any chance there will be much West in the swell when it hits the Northern Playgrounds? The swell hitting next Thursday and the one hitting week beginning 23rd July. Thursday's will have lots of south in it but also lots of size and be long-period in nature, so it will wrap into selected breaks. The following swells will be a touch more west of south, but still south-southwest at this stage. Thursday is likely the biggest swell now. So in short, no, not much west at all. Hey guys been in Indo(Bali) for several days now & it's been pretty woeful swell wise, going up to Medewi region for a few days nxt week (tues on), so keeping an eye on the swell charts & thinking Thurs will be out of control up there but does it back off a bit over the following days??? wonder if they will wait and hold it then? or utilise best tides of both days? Looks like howling onshore's in the SW for the big swell event. probably no where spared from a screamin WNW wind so even sheltered corners will be direct onshore's....blah. Gusts to 40 knots this morning. Yeah it all changed over the weekend with that second severe low firing up and spoiling the party. Bummer! Craig, how do these conditions (tuesday/wednesday) translate for the waves in the NW? Can anyone recommend where to head where it will be maybe 3-5 foot and not too many people? Hi Yogil, You could try the right around at Padang Bai where the boat to Lombok leaves from. It's protected & apparently breaks on large swells. I've been on the ferry back from Lombok coming in there and seen it at 4-6ft and perfect barrels - filthy water though. Yogil , in the interest of your safety and other more experienced surfers it would be a safe bet to stay out of the water over the next week or so. Most of Bali's west and east coasts will have little to offer the inexperienced . I second that! On swells like this, I wouldn't trust anything that looked 3-5 foot. There's every chance a wave much much larger than 3-5 foot will come through and catch you off guard. If I was you Yogil, I'd head up the Bukit and try and snag a seat with a good view over Ulus and settle in for 5 hours of watching the big blue telly. Albany bouy is 7.67m @ 18 sec, and NW winds. Dang work!! The footage will be interesting from the Right on this swell. I wonder whom the swell will be named after ! You could name it a triple up hoax hey !